As fourth quarter outstanding auto loan balances reached the highest level on record since Experian Automotive began publicly tracking the data in 2006, Melinda Zabritski reminded the industry how to view a slight uptick in 60-day delinquencies. According to its most recent State of the Automotive Finance Market report released on Tuesday, Experian determined 30-day delinquencies dropped across the board during the fourth quarter, pushing the overall rate to 2.57 percent from 2.62 percent a year ago. Conversely, 60-day delinquencies rose from 0.72 percent to 0.77 percent over the same time period. Experian mentioned all lender types saw increases in the percentage of loans that were 60 days delinquent with the exception of credit unions, which remained flat year-over-year. But Zabritski — the senior director of automotive finance for Experian — pointed out that the percentage of loans that were 60 days delinquent is still below the percentage in Q4 2007 when it was 0.8 percent. The report found that finance companies make up the largest portion of the $6.8 billion in loan balances that were 60 days delinquent. Finance companies — the category of originators that Experian said book vehicle installment contracts but do not generate commercial deposits — hold nearly 45 percent of these balances with a total dollar volume of $3.04 billion. They are followed by banks ($1.8 billion), captive finance companies ($1.2 billion) and credit unions ($737 million). “While rates in the more severe delinquency category are up, it’s important to note that the increases are modest and relatively low from a historical perspective,” Zabritski said. 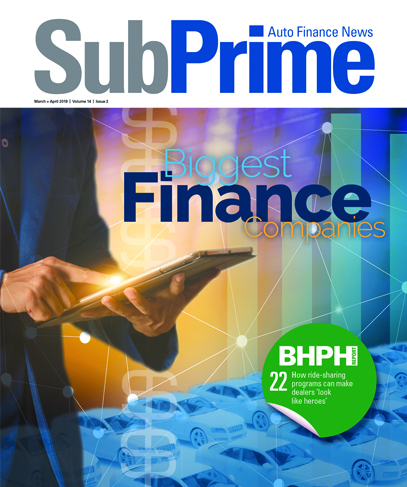 As Zabritski referenced, Experian reported that subprime and deep subprime contracts accounted for 20.3 percent of all open automotive loans, compared with 20.8 percent in Q4 of 2014. Total U.S. automotive loan balances climbed 11.5 percent to reach $987 billion in the fourth quarter. Experian explained the growth in balances was fueled primarily by finance companies and credit unions, which saw increases of 22.5 percent and 15.9 percent over Q4 2014, respectively. Despite those increases, however, Experian noticed banks maintained the largest share of loan balances at approximately $337 billion, an increase of 7.6 percent over the prior year. Captive finance companies — those owned by manufacturers — experienced modest growth, 6.3 percent, to reach $244 billion. “The boost in automotive sales has contributed to a strong quarter for all lender types across the industry,” Zabritski said. “That said, while loan balances continue to rise and funding may be more easily attainable, it is critically important for consumers to stay on top of their monthly payments to keep the automotive market running on all cylinders,” she went on to say.